Right on Highway 20, on the north end of town, Flyers occupies a red-barn style building. 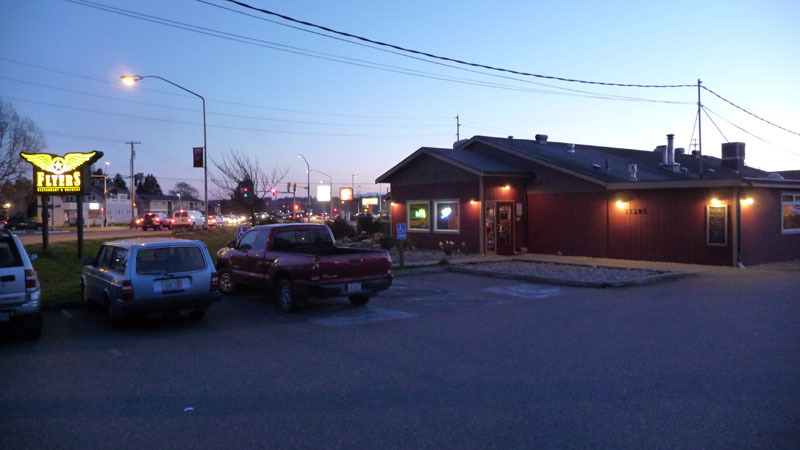 The overall environment inside is cozy and mostly small-town and welcoming. On the left as you enter is restaurant seating and on the right is the bar area. The restaurant has wooden tables and chairs along with several tall tables and chairs that line the half-height wall that divides this section from the bar area. The bar itself is polished wood with pine planks below and is lined with tall stools. 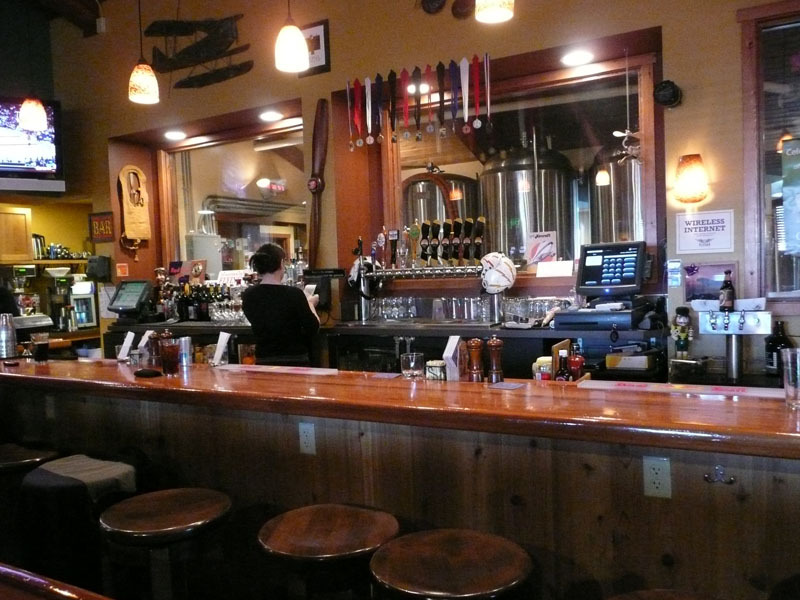 The "bar back" is a row of three large windows looking into the (small) brewery. Also in the bar are two large flat screen TVs. The floor is covered with an intriguing rough-hewn style wood. The peaked ceiling is covered with red-tinged pine boards and has exposed beams and ceiling fans. Lighting is provided by spotlights and track lighting. Walls are painted either bright yellow or a medium green. In the back is a fairly open kitchen with a full view of the wood-fired pizza oven. On the highway side is an outdoor patio enclosed by a wooden fence. Decorations reflect the name, Flyers, and match the character of the Navy town it's in. Model planes dangle from the ceiling, framed photographs of various planes cover the walls, and there are several strategically placed prop-plane propellers. 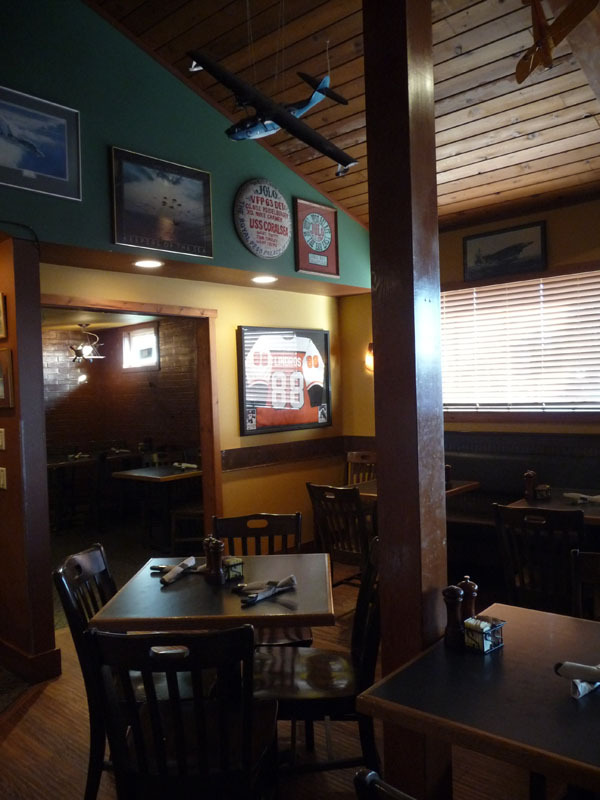 The food is decent - extensive choices but of run-of-the-mill pub and "casual" restaurant quality. On tap on our visit were Flyers six regular beers and four guest taps, so it's a reasonably good selction. The quality, however, is not earth-shattering or without flaws. There is a nice large parking lot. A Labor Day hike onto Whidby Island hugging the bluff & looking out onto the Strait of Juan de Fuca and the San Juan Islands on a perfect, overcast day brought a bit of serendipity. "Not sure," I said to wife Persimmon, "if there's a brewery here. Don't think so." "What's that," she replied. 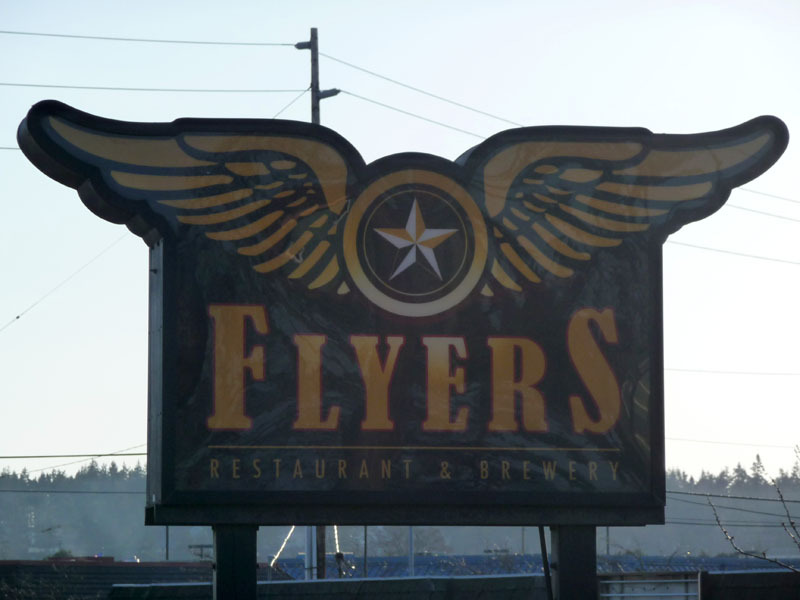 "Flyers Restaurant...(pause for effect)...and Brewery!" So after the hike, our reward was waiting. 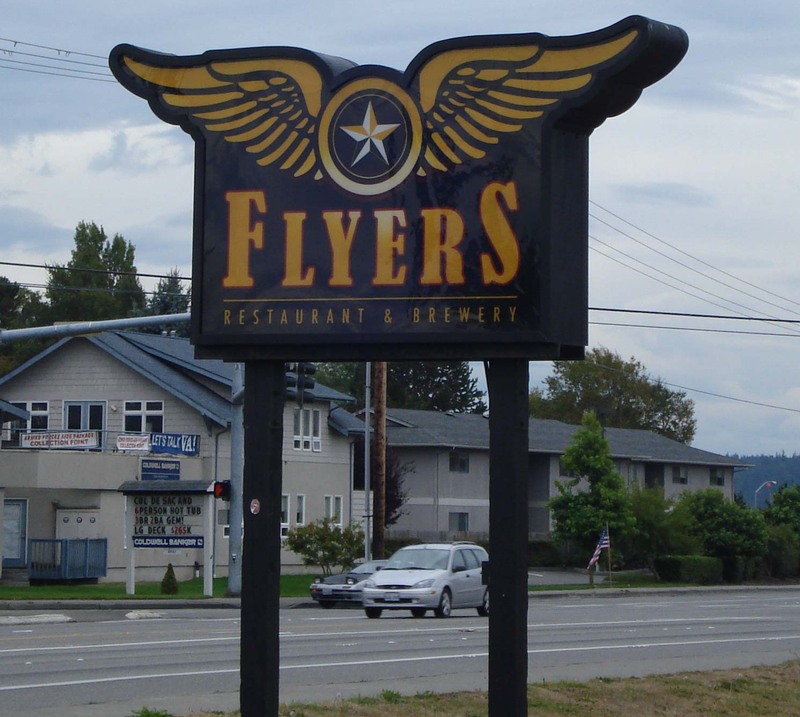 Open now for 2 years, Flyers is named for the obsession shared by the family Tritt beginning w/Granpa, a Naval aviator & continuing thru to Grandson Jason who is co-owner with his Dad Greg. Model planes hang from the ceiling w/flight helmets and photos covering a good portion of the walls. 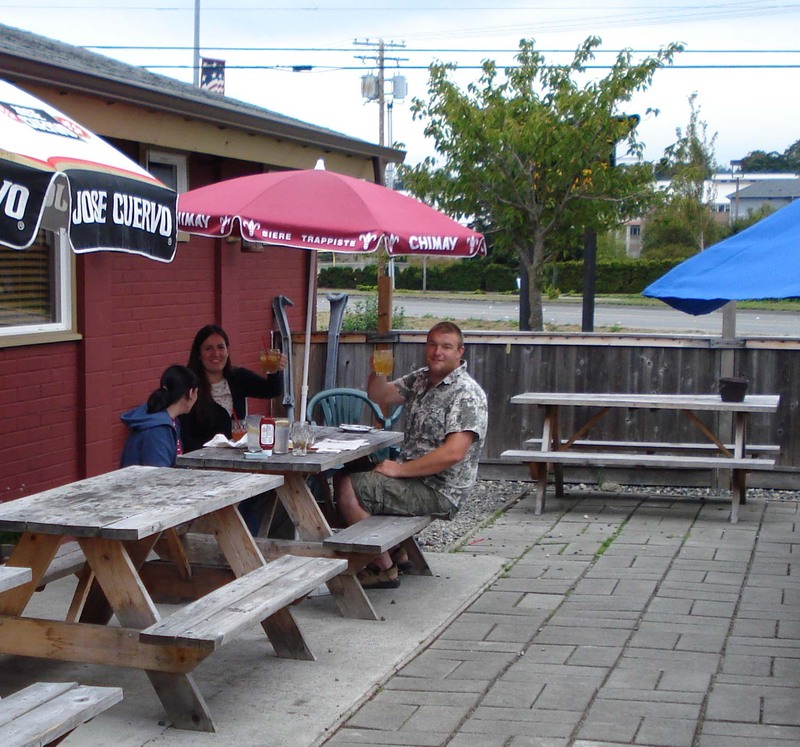 An outdoor beer "garden" was occupied by a group of 4 who called the restaurant "the best in town. They make a perfect Long Island Iced Tea." Their beer ain't bad either! Unfortunately we appeared after a busy weekend and of the 7 on tap, they had 3 available; Loopty Loop Loop, their lightest brew @ 2.8%ABV - the AFterburner IPA, a hoppy affair w/6 different kinds of hops & weighing in @ 6%ABV & their Pacemaker Porter, a 2006 Great American Beer Festival Gold Medal winner, a delicious concoction of chocolate & coffee that lingers on the back of the tongue then disappears only to come back for a second tug. Working a 7 barrel system, brewmeister Tony can't make it fast enough for the locals...they just keep comin' in. We will too in the future for a taste of the other 4 we missed as well as their Scotch Ale, featured now they tell us, at Bottleworks in Seattle. They've got a captive audience on the Island...the closest brewery is 30 miles away in Anacortes and those folks could take a lesson or two from Flyer's on beer selection and taste. So enjoy the flight... You won't be sorry...but you might walk away a little wobbly in the knees.